Also serving communities of Newburgh, New Windsor. There are 13 Assisted Living Facilities in the Beacon area, with 2 in Beacon and 11 nearby. The average cost of assisted living in Beacon is $3,500 per month. This is higher than the national median of $3,346. Cheaper nearby regions include Wappingers Falls with an average starting cost of $3,000. To help you with your search, browse the 32 reviews below for assisted living facilities in Beacon. On average, consumers rate assisted living in Beacon 3.3 out of 5 stars. Better rated regions include Wappingers Falls with an average rating of 3.4 out of 5 stars. Caring.com has helped thousands of families find high-quality senior care. To speak with one of our Family Advisors about assisted living options and costs in Beacon, call (855) 863-8283. Considered a distant northern suburb of New York City, Beacon, New York, is a small city along the Hudson River at the base of the Fishkill Mountains. Given its location on the water, Beacon played a role in colonial settlement, early trade, the American Revolution and the Industrial Revolution. Seniors may enjoy visiting the historical society, the arts scene, the farmer's market and the Long Dock Park on the Hudson River. About 14 percent of the city's approximately 14,000 residents are 65 and older, and because of this, there are 12 assisted living facilities in the Beacon area. Each of these facilities is licensed, certified and closely regulated by the New York Department of Health. Beacon has four defined seasons, with winter lows that will drop into teens and summer highs that will rise into the mid-80s. The spring and fall seasons are ideal, however, making this a great place for seniors to live despite the cold winter months. According to a report from the American Lung Association in 2018, Dutchess County, the county in which Beacon resides, received one of the worst air quality grades with a D grade in the report, making it possibly harmful for seniors. The cost of living in Beacon has risen steadily and is now more expensive than the state and national averages. Day-to-day necessities such as groceries, health care and utilities are considerably more expensive, which means seniors will have to pay more on a daily basis. Beacon has a rate of property crimes that exceeds the state average, but its number of violent crimes is below the state and national medians. Overall the city is safer ranks at 30 on a scale of 1 to 100 for safety among U.S. cities. The Dutchess County Office for the Aging provides transportation services for seniors. Vans and buses transport seniors to the eight senior friendship centers, or on shopping or recreational trips. Transportation to medical appointments also is available. The Beacon area has no/few facilities from which to choose in the event of a medical emergency or illness. The nearest major hospital is St. Luke’s Cornwall Hospital across the river in Newburgh, New York. Assisted Living costs in Beacon start around $3,500 per month on average, while the nationwide average cost of assisted living is $4,000 per month, according to the latest figures from Genworth’s Cost of Care Survey. It’s important to note that assisted living rates in Beacon and the surrounding suburbs can vary widely based on factors such as location, the level of care needed, apartment size and the types of amenities offered at each community. 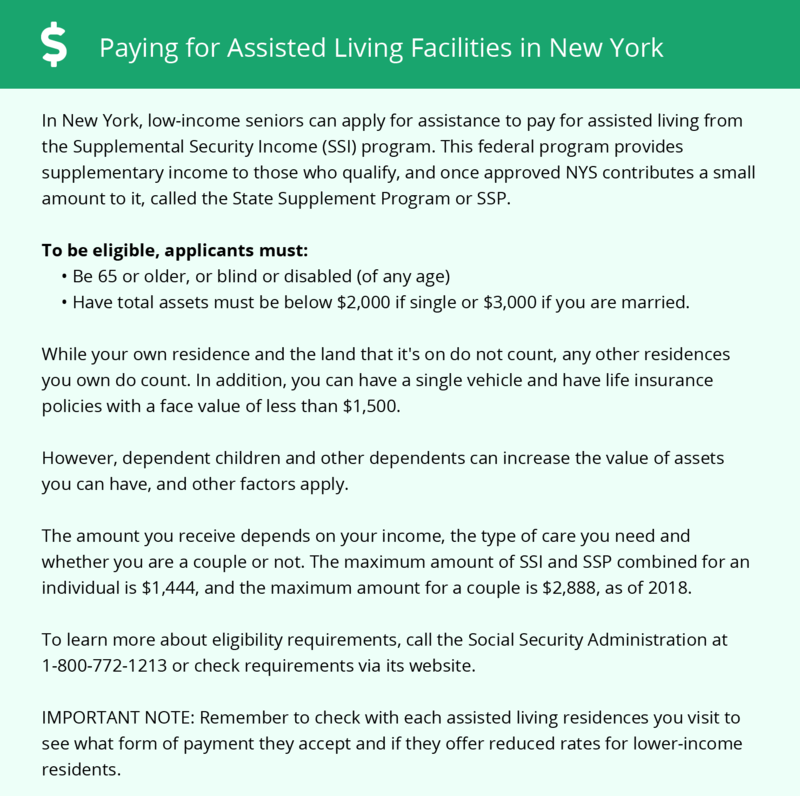 The Assisted Living Program offered by the state of New York will pay for a senior’s assisted living facilities as long as a high level of care is required for participants, equivalent to what one would receive in a nursing home. While non-Medicaid applicants are still admitted a small percentage of the time, 90 percent of the people in this program are on Medicaid. Beacon and the surrounding area are home to numerous government agencies and non-profit organizations offering help for seniors searching for or currently residing in an assisted living community. These organizations can also provide assistance in a number of other eldercare services such as geriatric care management, elder law advice, estate planning, finding home care and health and wellness programs. To see a list of free assisted living resources in Beacon, please visit our Assisted Living in New York page. Beacon-area assisted living communities must adhere to the comprehensive set of state laws and regulations that all assisted living communities in New York are required to follow. Visit our Assisted Living in New York page for more information about these laws.